I’ll be the first to admit that I have a bit of an addiction to baking blogs and, even worse/the best, to Pinterest. Like any addiction this one probably isn’t the healthiest, especially because I not only end up staring at delicious looking desserts for copious amounts of time, but I also find myself making and eating an unhealthy amount of treats. 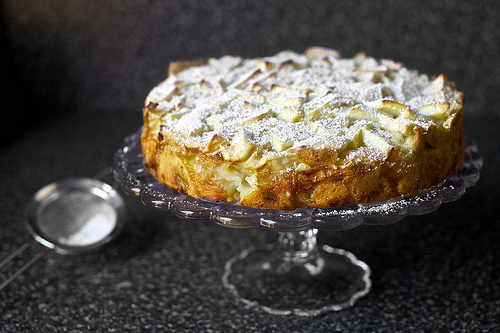 Things hit a new low, or maybe high, a few weeks ago when Smitten Kitchen posted a family recipe of hers: Apple Sharlotka. Never have I made a recipe on the same day that a blogger posted that very recipe. This was necessary though, crucial to my own existence I’m sure. I had to make this asap. Thankfully I had a friend with me that night to help with my own portion control issues. This dessert is delicious. Definitely on the lighter side of things (although that first night we did add ice cream to the mix) this cake can be enjoyed as an afternoon snack or even as breakfast. In fact, I see no problem with eating this at any hour of the day. Just be warned that this will disappear quickly. So quickly in fact I wasn’t even able to take my own pictures. All credit to Smitten Kitchen on this one. She’s a pure genius. Line the bottom of a 9-inch springform pan with parchment paper. Butter the paper and the sides of the pan. Peel, half and core the apples, then chop into medium-sized chunks. Pile the cut apples directly in the prepared pan. In a large bowl, using an electric mixer, beat eggs with sugar until thick. Beat in vanilla, then stir in flour with a spoon until just combined. Pour over apples in pan, using a spoon or spatula to spread the batter so that it covers all exposed apples. Bake in preheated oven for 55 to 60 minutes, or until a tester comes out free of batter. Cool in pan for 10 minutes on rack, then flip out onto another rack, peel off the parchment paper, and flip it back onto a serving platter. Dust lightly with ground cinnamon. Sometimes things get a bit excessive over here. Like let’s take cupcakes and instead make them into a massive cake that is completely covered in rich icingand chocolate. 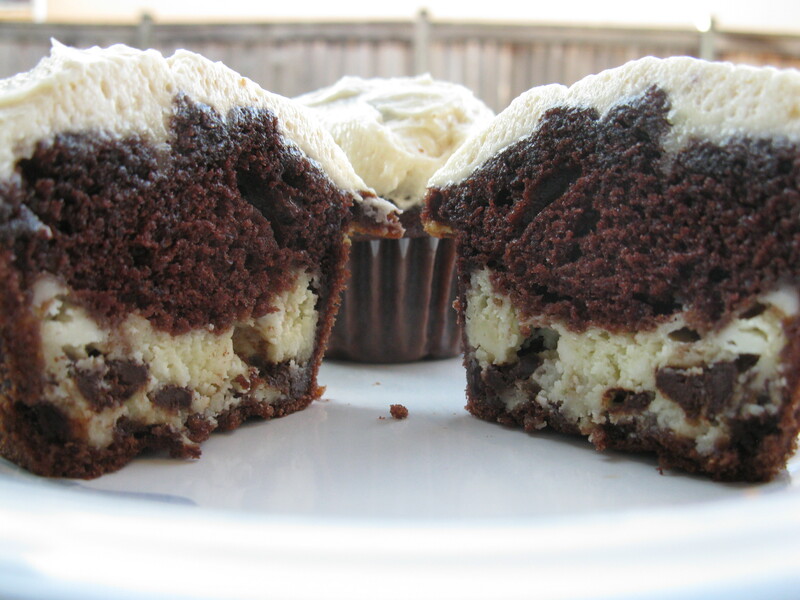 Or how about this past week when I decided that chocolate cheesecake cupcakes were too plain for my taste? Solution…peanut butter icing. What can I say? I know what I like and in some cases I throw it all together and hope for the best. These cupcakes are pretty good. I still don’t understand why they are called “black bottom” though, since all of the cheesecake sinks to the bottom, creating a “white bottom.” I should seriously be in charge of naming all desserts, but I digress. These are good. I felt like they needed some sprucing up, hence the icing, but to be honest I don’t know if that was the best idea. Maybe a ganache, maybe nothing? I’ll leave that choice up to you. I’ll be honest, these cupcakes were all about excess, and similarly, birthdays are all about excess, so I decided to combine the two this year. Can I just say that I have amazing friends. What a full weekend of celebrations, I couldn’t be more thankful for fun memories, incredible people and these cupcakes. Duh. Combine cream cheese, egg, sugar and salt. Mix until well blended. Add the chocolate chips and set aside. Prepare the cake mix according to package instructions. Fill paper cupcake liners 1/2 full with cake batter. Top with heaping tablespoonful of cream cheese mixture. Last year around this time I decided to start up this blog in order to document the different things that I tried my hand at baking. I’ve really enjoyed the process of it all and have been learning more and more as I go. This recipe actually comes from last year. 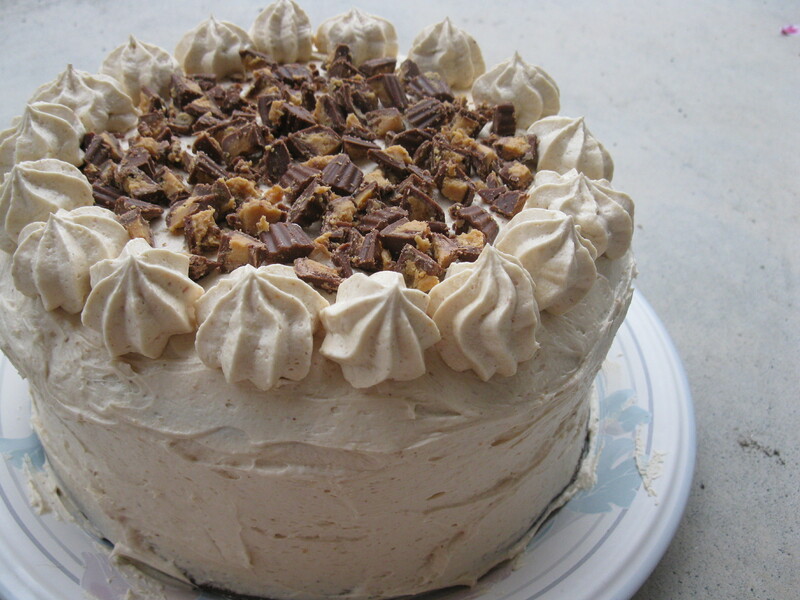 My dad had been raving about a mocha cake, from a bakery, that he had had at school one day and decided that he wanted that cake for his birthday. We fulfilled the request but the cake was not what he was expecting and left much to be desired. Needless to say, I decided to try my hand at baking him the cake that he had been dreaming about. Even though we aren’t a coffee drinking family, this cake is full of coffee flavour. 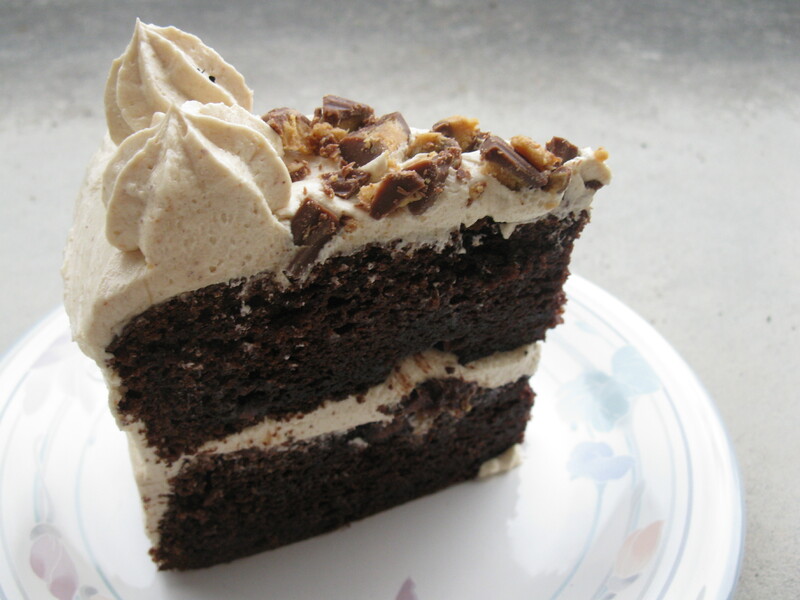 A two tiered, marbled black and white cake (aka the best of both worlds) is filled with coffee flavoured chocolate pudding and then iced with a mocha frosting. Result: better than store bought. As if it were ever a competition. Homemade wins every. single. time. The only problem, even though it tastes delicious, this cake looks atrocious thanks to my lack of photo skills and understanding of how to make food look appetizing. Embarrassing. I’d like to think that I’ve improved over the past year! Beat butter and 1 1/2 cups sugar at medium speed with a mixer 4 to 5 minutes or until creamy. Add eggs, 1 at a time, beating just until blended after each addition. Beat in vanilla. Add to butter mixture alternately with half-and-half, beginning and ending with flour mixture. Beat at low speed just until blended after each addition. Spoon 1 1/4 cups batter into a bowl, and stir in cocoa, 3 tbsp hot water, and remaining 1/4 cup sugar until well blended. Spread remaining vanilla batter into 2 greased and floured 9 inch cake pans. Spoon chocolate batter onto vanilla batter in pans; gently swirl with a knife or small spatula. Bake for 23 to 28 minutes or until a wooden pick inserted in center comes out clean. Follow the package instructions on how to make the pudding. When completing the liquids section, add in instant coffee and allow to dissolve. 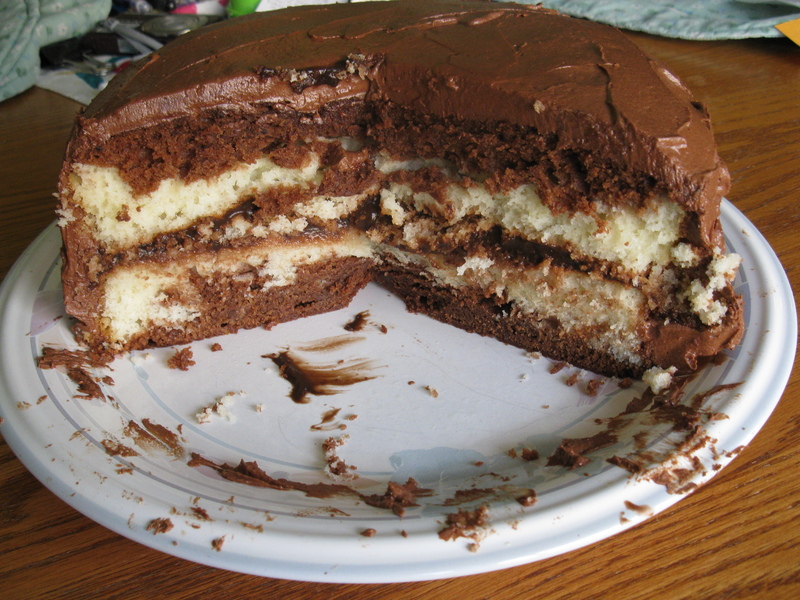 When the cakes are cool, spread the pudding on one layer and top with the other layer. Beat butter at medium speed with a mixer until creamy; gradually add sugar mixture alternately with coffee mixture, beating at low speed until blended. Beat in half-and-half, 1 tbsp at a time, until smooth and mixture has reached desired consistency. 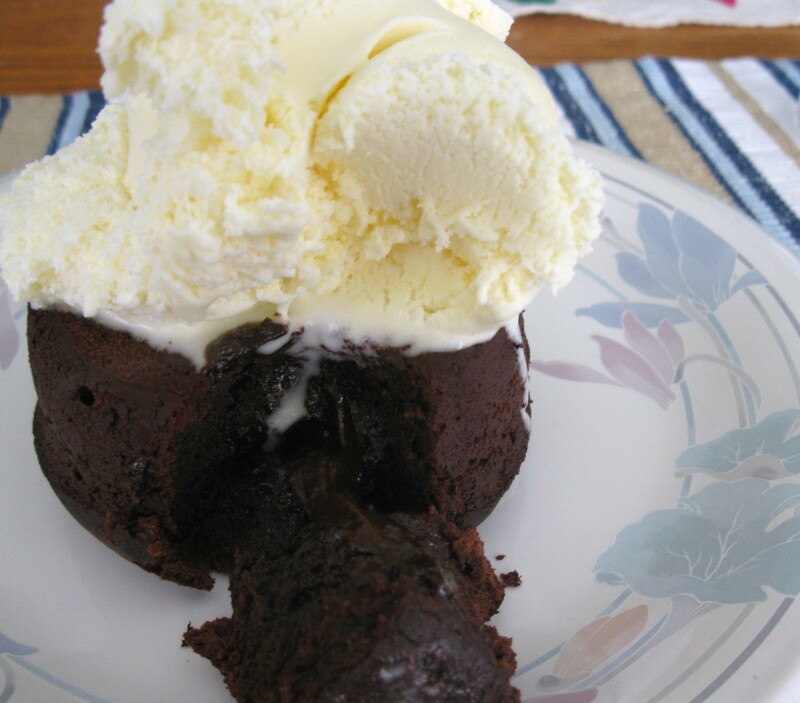 Frost the cooled cake with this icing. If you follow this blog you may have noticed that I’m often a season behind in my updates. 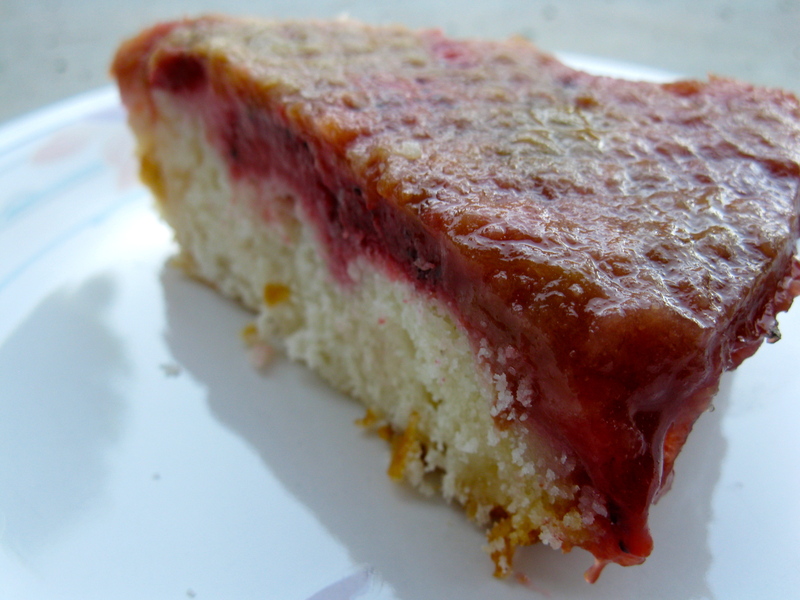 Christmas recipes come out in January and in today’s case, I give you a strawberry rhubarb upside down cake. Perfect, right? 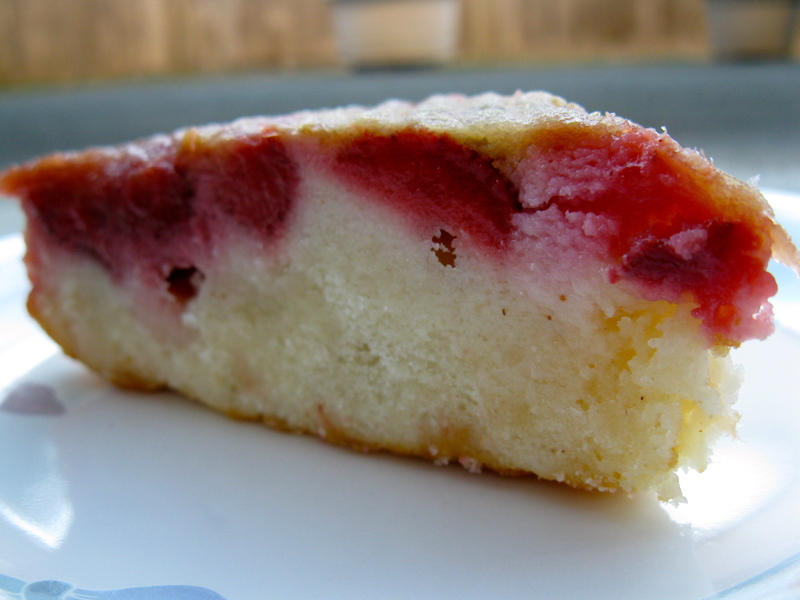 Strawberries and rhubarb are abundant at this time…yeah right. Well, no need to thank me when you make this next year! At least there’s always chocolate. Chocolate never goes out of season. We didn’t actually eat this cake fresh from the oven. Instead it was frozen and has recently been brought out to enjoy, with ice cream of course. I feel like this would be the perfect dessert for an afternoon tea. Not that I have afternoon tea, or live in England. Seriously I can’t wait to be 80 years old and have friends over for afternoon tea all the time. You’ll come visit me right? Preheat oven to 350F. Grease and flour a 9 inch springform pan. Melt the butter in a saucepan, add in the sugar. Stirring constantly, cook until sugar begins to melt and starts to turn a light caramel colour. Add the rhubarb. Continue stirring and cook for 3 minutes or until syrup starts to thicken. Pour rhubarb mixture into bottom of prepared springform pan. Sprinkle sliced strawberries on top. Set aside. 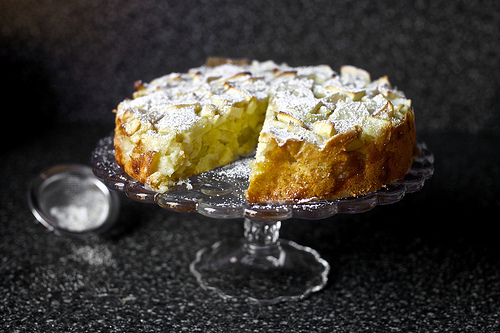 With a mixer, beat almond paste and sugar on low speed until the texture of small crumbs. Add butter and mix until combine. Beat on high for 2 minutes. Add egg and beat until very creamy, about 3 minutes. Combine the flour, baking powder, salt and nutmeg. Add flour mixture and milk to almond paste mixture. Mix on low speed until just combined. Drop spoonfuls of batter on top of fruit. Spread batter evenly across the top. Cook cake in pan on wire rack for 15 minutes. Run a knife around the edge of the cake and unmould the springform. Tip cake upside-down onto serving plate and carefully lift off bottom of pan. What happens when you allow your father to try something that you bake? He asks that you transform the same cupcake recipe into a massive birthday cake. And not just any birthday cake, HIS birthday cake. Let’s be honest though, this recipe is amazing so why not have my cake and eat it too? I ended up using two 8″ cake pans for this dessert and strategically placed a handful of mini Reese’s peanut butter cups into both tiers. In between the two layers, and all over the cake, was the greatest peanut butter icing ever created. Crushed peanut butter cups topped everything off. Note: cooking time for these babies was 38 minutes, otherwise follow the recipe for the cupcakes. This was delicious but felt like a bit of a work out to get through. Stick to the cupcakes if you’re after a “lighter” treat, otherwise eat your heart out, just like my dad did. Happy Birthday to the greatest Dad! Then these happened and I began to understand the obsession. Back to work means back to Friday treats. Naturally, I opted to bring treats the first week, try to set the bar high, let people know that this isn’t something that we take lightly, you know how it is. It was also a co-workers birthday so hello cupcakes! Seriously I work at the best school. Have you ever heard of a place where 3 teachers take all of their students into another teachers class to sing happy birthday to her? Have you seen teachers celebrate a birthday at recess with banners and Disney princess party hats? Welcome to my daily life, it’s amazing. Back to the cupcakes. These were incredible. 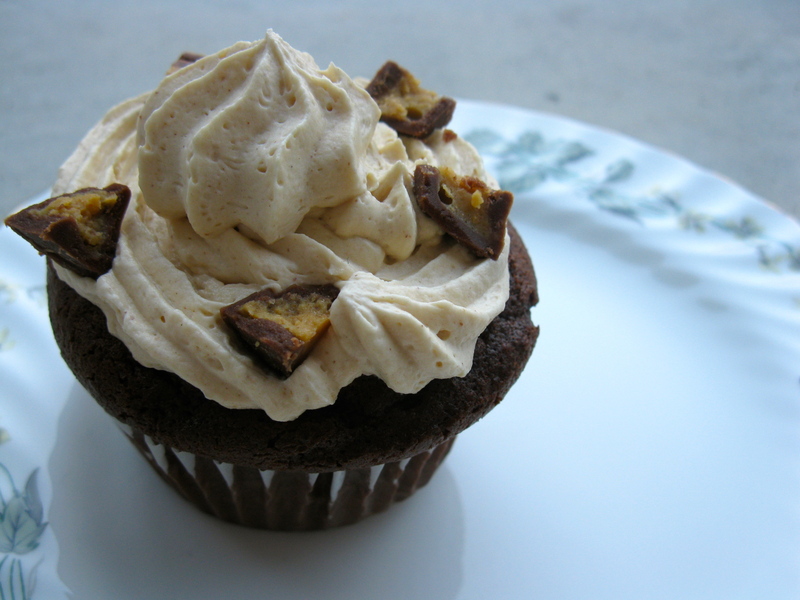 The chocolate cupcakes are surprisingly light and inside of them you will find hidden mini Reese’s peanut butter cups. The icing is a peanut butter frosting that is to die for, unless you don’t like peanut butter, in which case you might not like these, in which case you are crazy. Sorry. To top it all off, cut up pieces of peanut butter cups are sprinkled onto the icing. Decadent. Eat these, die and go to heaven…or maybe just eat another cupcake? Freeze Reese’s Miniatures for at least an hour. 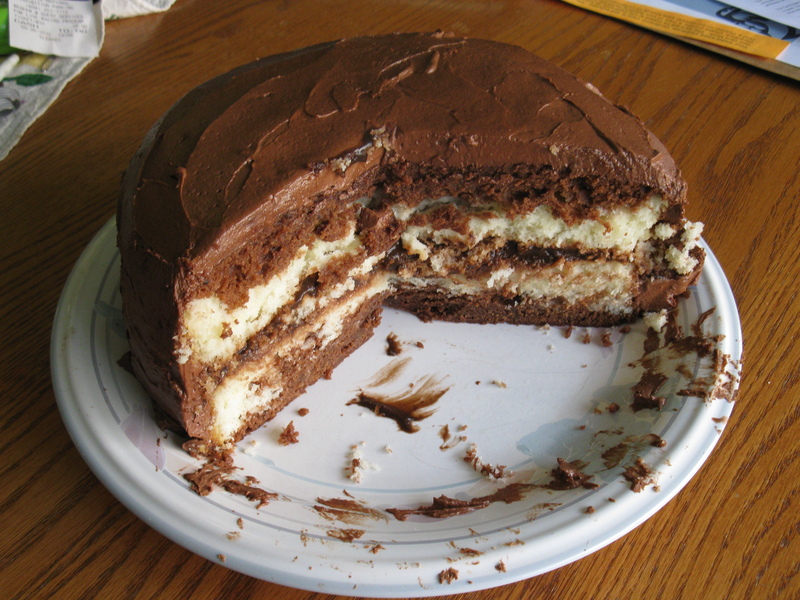 In a large bowl beat together the cake and pudding mixes, sour cream, oil, eggs, vanilla and espresso water mixture. Beat on medium speed until well combined (about 2 minutes). Pour the batter into the muffin wells (I ended up getting 21 cupcakes). Depending on the size of your Reese’s Miniature press 1 peanut butter cup into the center of each cupcake (my mini’s were very mini so I used 2 for each cupcake). Using a spatula, cover the imprint with cake batter. Bake for 18-22 minutes or until the tops of the cakes spring back when lightly touched. Once cooled, remove cupcakes from muffin tins and allow to fully cool on a wire rack. Once cupcakes are cool, prepare your frosting. In a large bowl, cream butter and peanut butter on medium speed until fluffy. Turn the mixer down to low speed and slowly add the icing sugar, and continue mixing until well blended. Add vanilla and milk. Blend on low speed until moistened. 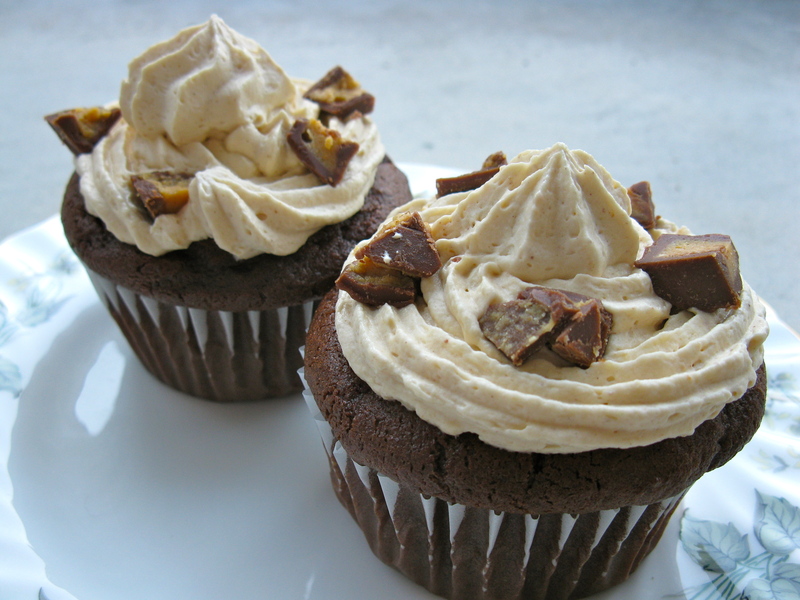 Pipe the frosting onto cooled cupcakes and finish with chopped Reese’s Peanut Butter Cups. Be sure to refrigerate the cupcakes until ready to serve. Father’s Day was postponed around here, so in an attempt to make up for a challenging Sunday I figured that I would cater to my dad’s wishes and whip up an amazing dessert on Monday night. I love my dad with all my heart. 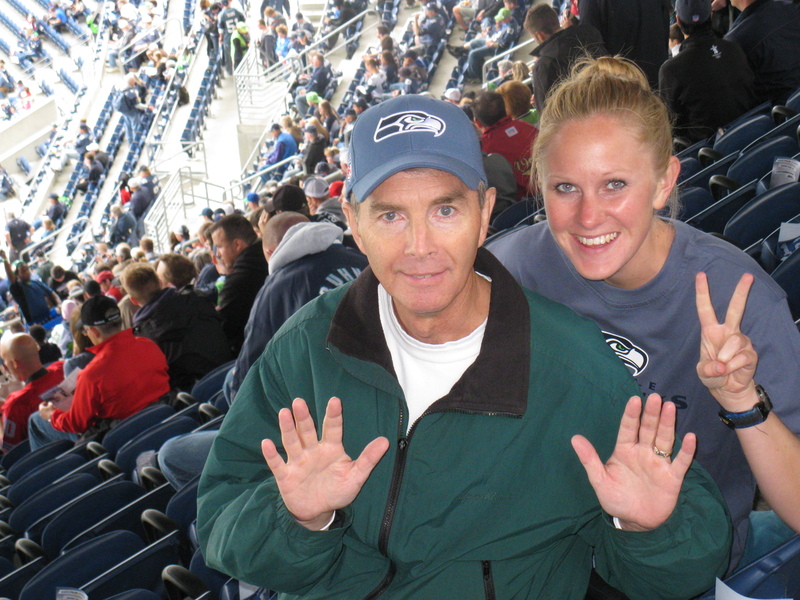 I can’t imagine life without him and am so thankful for all of the life lessons that I have learned from him. From playing soccer and baseball together at the park, to sharing our love of horses, to road tripping down to the States to watch the Seahawks play, I had it pretty good growing up. So blessed. Supporting our Seahawks as the 12th man! But sometimes he makes me wonder. I mean, how many other men on a Friday or Saturday night would grab the remote and flip the tv onto the W network? Chick flick central. I kid you not, the other day when I interrupted his Saturday night and asked what he’d been up to the response was, “I was watching that J. Lo movie, the Wedding Planner. I missed the beginning but still managed to see the best part, the scene where the horse runs away.” Only my dad. So classic. A love of chick flicks can only be paired with a sweet tooth and chocolate is what my dad always orders for dessert. So what to make for him? 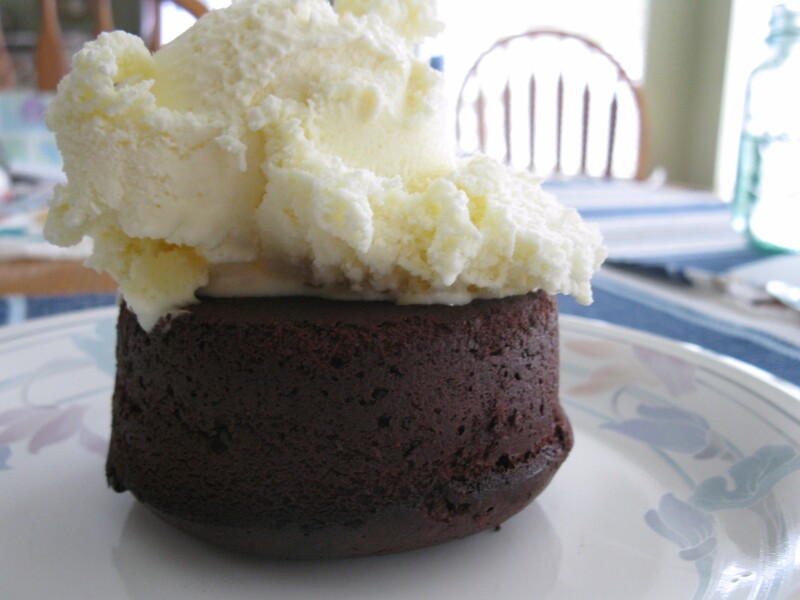 Molten lava chocolate cakes. Definitely a fave of mine and apparently my father’s. Hey, I’m not complaining. While on a family roadtrip to Portland, Oregon we discovered Chili’s version of this dessert. We became obsessed and quickly catapolted this cake into our top all time favorite desserts. A delicious girls night treat, or in my case a sure fire way to please dad! Sprinkle 1 tbsp cocoa into a greased ramekin. Tilt ramekin to coat bottom and sides with cocoa. Tap excess cocoa into another greased ramekin. Repeat for a total of 6 ramekins. Set aside. Heat butter and cocoa in small saucepan on low heat, stirring often until melted. Remove from heat and stir until smooth. Cool slightly. Beat egg yolks and whole eggs in a medium bowl for 2 minutes or until frothy. Beat in icing sugar on low. Add chocolate mixture and flour. Beat well until thick and glossy. Spoon batter into prepared ramekins. Bake for about 12 minutes until batter rises evenly, edges appear set and middle is almost set (I baked mine for 12 minutes and wished that I had taken them out earlier). Run knife around sides of cakes to loosen. Cover with individual plates and invert to remove from ramekins.